Dr Madge answers some common questions. Ooh, fresh meat... I mean, uh, you're in for quite the treat. So your general, unspoken objective in Two Point Hospital is to create a profitable hospital. Your role in this is somewhat indirect. You design rooms and hire staff, but there your influence more or less ends. From pebbles come landslides, however. If you do not design your hospital to be efficient, you definitely will notice the consequences. Fires, vomit waves, staff resignations, bodies in the corridors and, ultimately, bankruptcy. Your game ends when you are too deep in debt to dig your way out. 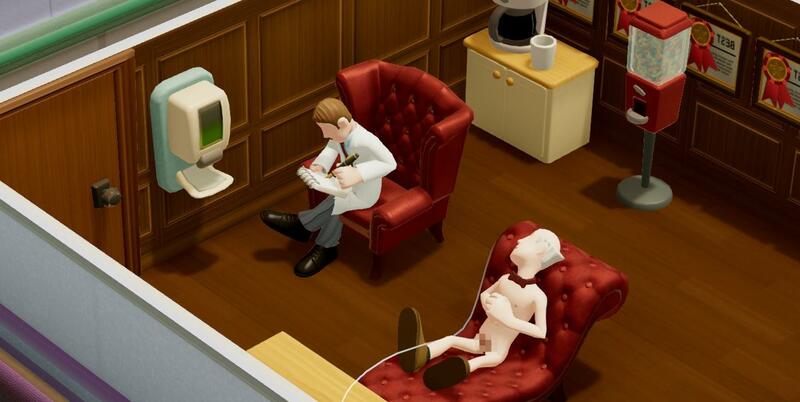 Two Point Hospital is a game where the fun is in learning. The Career mode is where you should start. It will guide you through the process of hiring staff, building rooms, and slowly work towards training and research. What it will not do is explicitly tell you things like how many GP rooms you need. (Hint: considerably more than one.) It gives you the tools, but the strategy you have to figure out for yourself. With that in mind, I recommend you don't go diving headfirst into strategy guides, because you're actually missing out on the learning process. And learning is fun! Do not skip the Career, tedious though it may be at first. The sandbox assumes you know what you are doing in every way. It will not introduce you to how the rooms work, or what you need to research and why. Some things have changed since you were last in the neighbourhood, friends. Rooms no longer need to be square. Sexist hiring practices are behind us. Nurses are considerably more useful than they were previously, in both diagnosis and treatment rooms. Staff training has been significantly expanded upon. Janitors must now chase after the ghosts haunting the halls, and require a specific qualification to do so. Epidemics have been overhauled and are 60% less frustrating. One big difference is there's now just the one fail condition - too far in debt. Your victory conditions are also more specifically laid out. Overall, your objective is to get a three star rating in every map. But don't think that means grinding one hospital until you get three stars. That's a rather counterproductive method. Instead, jump between hospitals frequently. So, probably the best way to introduce you to how a hospital works, is to follow the path of a single patient. Understanding this will inform your strategy considerably. A patient first arrives in your hospital, either from the underground or the helipad. They will head directly to the nearest reception desk. The Reception desk is found under the Items tab, right at the top of the list. Reception has to be manned by an Assistant. Assistants play a handful of roles in your hospital, with Reception being the most important one. Click on the Hire tab and grab an Assistant. Once the Assistant has checked the Patient in at Reception, the Patient heads to a GP office for the initial consultation. The most important room in the hospital... The GP room is 3x3 minimum size. It also needs a desk and filing cabinet as its minimum objects. The building tools are quite easy to use. Right click can be used to empty your cursor or cancel an action. The GP room needs, no surprise, a Doctor. You may notice that your staff have Qualifications and Traits. Traits can be negative (e.g. Unhygenic) or positive (like Fast Learner). If you hover over the traits, a tooltip will appear that explicitly tells you their effect. Qualifications can be necessary for staff to do certain jobs. For example, your Janitors cannot catch a wayward ghost unless they specifically have the Ghost Capture skill. Ghostbusting is not for amateurs. The GP room does not require a qualification. Any Doctor can work here. However, there is a GP qualification that boosts a Doctor's performance in this room. The Diagnosis qualification is more general, giving a small boost in any diagnostic room. So, the Patient meets the Doctor in this room. If you are lucky, the Doctor will straight up diagnose your Patient here and now. Efficient! Sadly though, our example Patient is going to need a bit more diagnosis. Which exact diagnosis room the Doctor sends the Patient to, is a bit of a mystery. It is believed that low skill Doctors will pick a diagnosis room randomly. Higher skill Doctors will choose the room that will add the most diagnosis power. In our example, the Patient has been sent to General Diagnosis. General Diag is run by a Nurse - preferably one with some skill in actual Diagnosis, although this isn't required. The EZ-Scan machine is where the action happens. Machines need maintenance from Janitors. So hire one if you didn't already. If you click on the machine, it will show its health. Machines will catch on fire if their health is too low. Fires are dealt with by Janitors, wielding a Fire Extinguisher. So don't forget to actually place some extinguishers in your hospital. They are one-use items. So also don't forget to replace the extinguisher after it has been used. The Nurse whacks our Patient with the EZ-Scan and hey presto. That 12% more diagnosis. With that, it's straight back to the GP. Oh, there's a queue. Several patients have checked into the hospital and are queuing up for the GP. Our patient joins the back of the line. And it looks like she's hungry. And thirsty. And bored. And needs the loo. Our patient will gladly go wandering for several miles to find the one bookcase in the entire hospital. Or the one vending machine, or the one toilet block. Do not build a massive toilet block in the middle of nowhere. Your patients will spend all their time walking to it, instead of getting diagnosed. Every hospital building should have a toilet, however small. It makes a big difference. Also have food and drink machines spread out evenly. Entertainment devices, like bookcases, should be within easy walking distance as well. So, after a brief trip to the loo, the patient is back in the queue. Looks like it's our turn next. And... well, damn. The Doctor is tired and is going to the staff room. Unfortunately, the only staff room is on the other side of the map. Looks like everyone is going to be queing a while longer. And all the time, their health is steadily ticking down. After a short while, our Patient needs the loo again. This is how Patients die - wasted time. Staff rooms also need to be abundant and decked out with items, so that staff regenerate their Needs as soon as possible. Crap. The hospital has a lovely Psychiatry room, but no Psychiatrist. This is a room that needs a specific qualification. It's strictly Psychiatrists only in here. Well, there are two answers to that. One is Training. The other is Marketing. Training is the reliable method. The Training room becomes available to you later on in the game. You can place any Doctor with a free qualification slot in the Training Room. Then select the Psychiatry training course, and someone to teach it. The Doctor will be trained as a Psychiatrist. Marketing is another room that will appear later in the game. It is run by Assistants that have the Marketing qualification. For a fee, you can have them put out a recruitment campaign for Psychiatrists. This should skew your prospective applicants towards having the right qualification. However, it is not guaranteed. So, we gained a Psychiatrist. He adds another 8% of diagnosis to our Patient. Incidentally, Psychiatry is both a diagnosis and a treatment room, performing either function. Patients with diseases like Mock Star are cured in Psychiatry. If you want a mult-purpose room to focus on either Diagnosis or Treatment, but not both, you can toggle the room in the room's tab. By default, the room will serve both functions. Yup. Back again. I said the GP room is the most important room in the hospital. This is why. The well qualified, experienced Doctor in the GP room adds a whopping 25% of diagnosis. Now that's efficiency. Our Patient has been diagnosed with Bed Face. That's a disease that is cured in the Ward, so off we merrily go. The Ward is another dual purpose room, doing diagnosis and treatment. It is run by Nurses. Several Nurses. The Ward can be built with as many beds as you need, and staffed with as many Nurses as you like. One Nurse is adequate, but you can click on the room and add more staff slots. No qualification is required to work in the Ward. However, the Ward Management qualification will boost efficiency. Our Patient goes to the Ward, undresses behind the screen, and gets in the bed. After a few visits from the Nurse, they get out of bed and get changed again. They step outside the Ward and promptly die. They turn into an angry haunting spirit that terrifies the GP queue. Then, finally, the Janitor with the ghostbusting skill vacuums her up and puts an end to the chaos. *Ahem. * Our Nurses are unqualified interns, with poor Treatment skills. As your staff work, they gain experience, and become ready for promotion. Each promotion improves their abilities in Treatment and Diagnosis, and open up a training slot. Another way you can improve treatment outcomes, is to upgrade your machines. Treatment clinics like the Pharmacy can have their machines upgraded, by an appropriately qualified Janitor. A level 2 Pharmacy machine is more likely to cure, and not kill, the Patients using it. Machine upgrades will become available to you either through Research, or Career progression. One of the strategies every player learns early on, is to group your rooms so your staff members can move efficiently between them. For example, a Doctor focused in Treatment should be working in your treatment clinics. Clustering those clinics together, with a toilet and staff room nearby, prevents your staff from having to walk long distances. If you have to choose between a single-disease clinic and a multi purpose room, the multi purpose room comes first. It will be better value for money. The most expensive rooms to operate are the DNA Lab and the Surgery. Surgery requires a Doctor and a Nurse, so it has a high staff burden. The DNA Lab is extremely slow, needs a special qualification, and makes a poor diagnosis room. I recommend setting it to Treatment only. By cutting out Diagnosis, you're reducing the number of specialist trained Doctors and expensive DNA rooms.